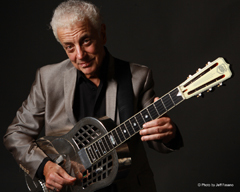 Doug MacLeod, a prolific singer, songwriter, engaging storyteller, and masterful guitarist, was born in the blues and is rooted in the American tradition. MacLeod is a perennial Blues Music Award nominee and multiple Blues Music Award winner. He recently won the 2016 Blues Music Award for Acoustic Artist Of The Year and the Blues Blast Music Award for Male Artist of the Year. He is a traveling artist who writes and sings original songs that are based on his own life and experiences. He learned from the old masters, lived the music and carries forward a valuable tradition. At the heart of a Doug MacLeod performance is his knack for storytelling, bringing characters-from the faceless to the legendary-to strikingly real life. As a youth MacLeod overcame abuse and a crippling stutter by turning to music. After picking up a guitar, and singing - he found his voice. While he developed his rich, soulful singing style MacLeod also worked out a unique, unorthodox and powerfully rhythmic acoustic guitar style. The rage of a turbulent youth was eventually channeled through the guitar. MacLeod uses a relentless right hand to pound out an insistent, churning beat to complement his intricate bottleneck and finger-style technique. MacLeod's playing landed him sideman gigs with George 'Harmonica' Smith, Big Joe Turner, Pee Wee Crayton, Eddie 'Cleanhead' Vinson, Lowell Fulson and Big Mama Thornton. Over 29 years, 20 studio albums, several live records, compilations, a blues guitar instructional DVD and a live performance DVD, MacLeod has consistently earned raves. His songs have been covered by many artists including Albert King, Albert Collins, Joe Louis Walker and Eva Cassidy. He has co-written songs with Dave Alvin and Coco Montoya. In every note he performs and records, MacLeod follows the rule-of-thumb he learned from country bluesman Ernest Banks of Toano VA.: "Never play a note you don't believe" and "Never write or sing about what you don't know about."